Please find below our entry form for the out kids competition on the 18th Feb 2018! There are also some pics to show just how friendly it is and how well it's run! We hope everyone has had a good break over the festive period and we know you're all desperate to get back on the mat so here are the dates! 10th Jan - full-time training starts back again with the 1.30-3.30pm class and weekly randori. Our 2018 calendars are up on the calendars page, it is going to be a busy year! Please see below the newsletter highlighting what we have achieved since March. The Eastern Area Open is a British ranking event for Pre-cadets, cadets and seniors. This weekend we had three players competing plus two who recently finished AASE with us. On the Saturday Rosie fought in the cadet open weight for girls and won a bronze medal. On Sunday was the senior and junior event, Ben Caldwell secured a silver medal in the under 60's for seniors, Jessie won a bronze in the under 63's for seniors and Toby won silver in the under 90's. We think this should leave them 4th, 8th and 21st in the senior British rankings respectively. The junior was fought by Jessie, Toby and Rowan who won bronze, silver and gold respectively. In total this weekend we won 1 gold, 3 silvers and two bronzes with a very small team. Of course the club contributed to the refereeing and officiating as well with both Mark and Tasha referring at the event and Sally and Leigh working on the tables. Photo's courtesy of Ian Caldwell. ​If you'd like information quicker please follow us on Facebook, twitter and instagram. 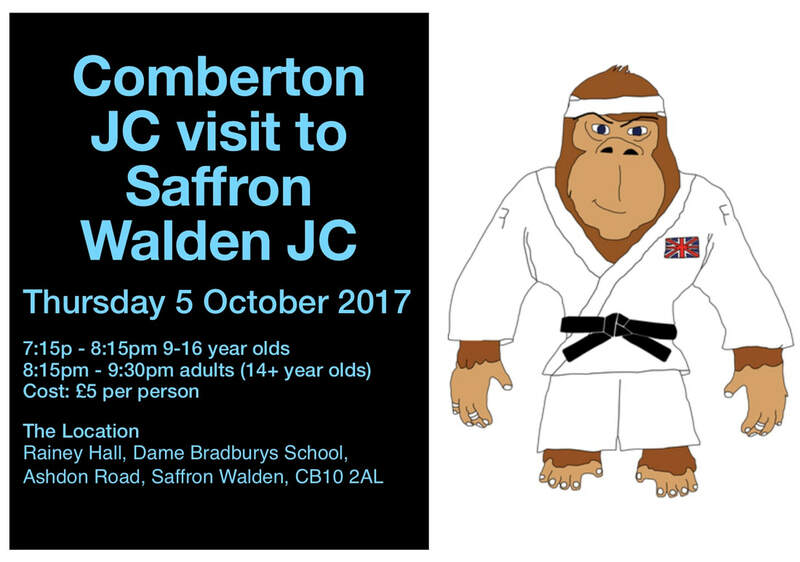 As part of the changes to Comberton Judo Club we have now successfully changed our team kit. For the performance players we now have Under Armour that is black and sky blue, you can see how cool it looks in the pics below. The club will order this kit 3-4 times per year, the next mass order will be in October. Because of the cost of Under Armour kit we decided to have a second option. We have t-shirts that cost just £10 with the gorilla log on the front and the "come to judo" logo on the back. In time we'll be expanding this range with hoodies and other items of clothing. If you have a wish list let us know! If you would like to purchase any kit please contact one of the coaches who will give you more information. The t-shirts we already have on bulk so you can buy one whenever you like, UA kit needs to be ordered. The Littleport Green belt and under was this weekend. We had three players fighting in this event. Flecity Clarke won silver, Leonard McCormick also won silver and James Challis came away with a 5th place. Also this weekend Rowan Lockyear and Toby Beamiss fought in Poland for GBR. Unfortunately both athletes went out in the first round to their German and French opponents respectively. They'll now both participate in the training camp. We're planning our next trip for 2019 so start saving!